The house is situated within 100 metres of the historic rampart walls of this beautiful character filled fortified town, steeped in history and architectural heritage with its quaint winding cobbled streets and Gothic churches. Famous for being the setting for Victor Hugo's 'Les Miserables' a leisurely walk around the ramparts offers stunning views across the surrounding countryside and appeals to those who wish to experience a traditional French flavour without travelling too far. Beaches, shopping and golf and famous Le Touquet all within close proximity. Walks and water sports along the river Canche within easy walking distance. There is a typical French market every Saturday morning with a range of fresh local produce on offer. The town is also home to an award winning Wine Society shop, superb Fromagerie, numerous Pattisseries (the nearest only 2 mins walk away) and Chocolatiers as well as many other interesting shops, cafes and restaurants. The whole house has a traditional feel with period décor and furnishings and is fully gas centrally heated. The entrance hall leads into the dining room. Through a door on the left is a cosy sitting room with two sofas and an armchair, perfect for relaxing in front of the TV which offers a number of British channels including BBC1, BBC2 and ITV. Shuttered windows look out onto a small traditional road, just off the main cobbled street. Behind the dining room is a small, fully equipped kitchen. Also located on the ground floor is a shower room which includes WC. The staircase leads to the first floor with two bedrooms facing the front. One has a double bed, the other has twin beds plus another single bed. There is also an upstairs bathroom with bath, WC and wash basin. Small, intimate, private courtyard garden with bistro table, 2 chairs and BBQ - access via the kitchen. The Northern France / Nord-Pas-de-Calais region: This area is commonly known as the Opale Coast with many seaside resorts and long sandy beaches stretching from Calais to Stella Plage. There are many activities available in the surrounding area including 9 golf courses, beautiful country walks and many cycle routes. Fishing and canoeing can be found on the river Canche and wind surfing and kite flying festivals are held at the modern beach resort of Berck each summer. To be found in this region are numerous historic British and Canadian war cemeteries from the First and Second World Wars. New Refurbishment: The house has been recently refurbished to combine modern comfort with traditional French living. There is a very small, private, walled courtyard leading from the kitchen. It has a compact garden table, a barbecue and a couple of chairs. High chair available on request. There is street parking in the road outside and more parking at the end of the road. It is a rare thing when both autumnal weather and chosen venue are in unison. 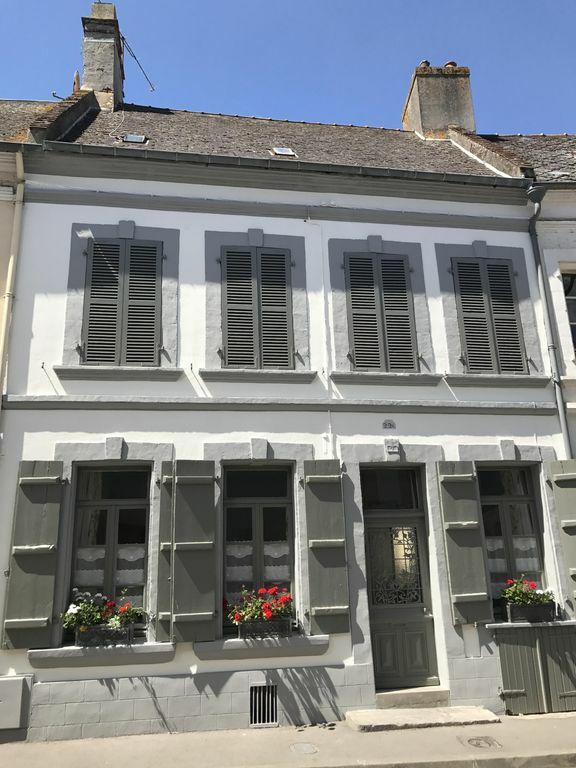 Such was our good fortune when renting this townhouse in Montreuil-Sur-Mer, a place where only the soulless would be unable to squeeze history out of thinnest air. From the stunning panoramic views from ramparts (like no other in our experience) to the cafes and restaurants of the town square and beyond, it is safe to say, Montreuil is genuinely unique. When taking a stroll about the place it would be the easiest thing to forgive anyone visiting for the first time to assume they have travelled back to times long gone. ‘Magical’ is the word that comes to mind. The property is delightfully quirky, yet has a certain, undeniable charisma. Unquestionably it is furnished far better than most stereotypical gites we have visited over the years. Comfortable upholstered chairs for example are, in our experience, a rare thing. Moreover, the general decoration and artwork reveal more than just a hint of panache. All credit to the owner in that regard. In practical terms, and kitchen wise, everything one needs is at hand. Fathoming the set up of the UK channels TV proved difficult at first, yet once we had grasped the methodology it ceased to be an issue. Likely my ignorance insofar as technology is concerned was my enemy rather than said TV! I note other reviewers have covered the worthy sights and sounds of the surrounding area. I shall merely say, ‘I concur’. We must add that for those with a passion for fresh food...especially so fish, meats and vegetables...the Saturday market is a must. Sadly, there is no comparison twixt the top quality fare on sale to the lack of the same when having the misfortune to visit a British ‘equivalent’. Additionally there are several superb boulangeries, one in particular just a very short walk from the property, that also put their UK equivalents to shame in terms of product and customer service. We strongly recommend this property, just a stone’s throw from both battlements and cobbled square, to any interested parties. Thank you Mike & Shirley for your lovely review. We are so pleased that you had an enjoyable stay and that Montreuil has made such a positive impression. Beautiful character property with everything you need. My parents shared this house with us for 3nights and it was perfect. Close to the restaurants and also the ramparts. Parking was easy. The house was great for 4 adults and we had a very comfortable stay and hope to come back. Family of 4. We enjoyed the property very much. Lots of charm and character. Location is perfect. Many bars and restaurants to suit all tastes and budgets. We would so recommend a visit to La Chartreuse de Neuville only 3 miles from the property, a hidden Gem. Good house with just what you need for the stay. Great location easy to walk to ramparts and centre . Perfect for touring the area . Thank you for your review, we look forward to welcoming you again in the future and thanks for watering the window boxes! Beautiful property in a wonderful location. We thoroughly enjoyed our stay, we had everything we needed in the cottage. The location is amazing, so many good restaurants to choose from, set in an olde worlde town. We walked the Remparts taking in the beautiful views. Boulogne and Le Touquet a short drive away. Everyone was super friendly and helpful in the town too. Furthermore, it was easy and quick to find from Calais. We would definitely visit again. We booked this property based on the location, the reviews and the character of the accommodation (and the town). I am glad that we did, as we were not disappointed. the house retains a lot of original character and has all the mod cons to make it comfortable. We visited during a mini heatwave, and the ground floor was a relief/respite from the heat, the tiled floor in the dining area give a cooling respite when returning during the day. The town has a lot of history and a very nice walk along the ramparts, approx 200m away and near the citadel, ideal for picnics. The restaurants are very highly rated and the variety to suit all tastes, however on the 1st morning we visited the Saturday market, excellent fresh tasty produce, so much that we brought too much (after tasting) we ended up having picnics and cooking at home. Highly recommended in comparison on all levels of similar properties including the good price for the rental, could of happily stayed a lot longer. Thank you for your lovely review Matthew and we look forward to welcoming you again in the future should you be visiting the area again. Montreuil-Sur-Mer remains a town of infinite fascination and considerable beauty with the river Canche providing tourist and leisure facilities. The fortifications are now promenaded by visitors and those hoping to gain a sense of the town's history. There are a number of fetes and local celebrations including an outdoor theatre presentation of 'Les Miserables' in the Vauban designed citadel. It is also possible to take a 'Les Miserables' literary tour of the town. The floral displays that decorate the streets and buildings every year have resulted in the town winning prestigious national awards. There is a local train station making it is possible to travel to places such as Lille and Paris. Le Touquet is 20 mins drive providing an expansive beach along with the shops and restaurants that give a chance to see how the chic in French society live. *Prices may be subject to change at the owners discretion. *Peak changeover day - Saturday. *Off - Peak - Flexible changeover day and short breaks available. *NOTE : Bed linen & towels NOT supplied. *No smoking or pets. *Full amount payable 6 weeks prior to departure.